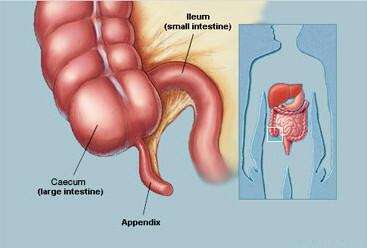 Appendix is a short sac that looks like a worm, located between the small and large intestines. Although some people think that it has no function, the appendix contains immune system cells that help protect the body from infection. When your appendix gets inflamed, you may have appendicitis which is the most common cause of emergency abdominal surgeries. It is commonly seen in males of 10 to 30 years old, and is associated with fever, abdominal pain and other symptoms. So, what causes appendicitis? However, it can develop infection with pus formation being left untreated. It is not clear what exactly causes appendicitis, but some experts think it is a result of certain factors. Consumption of a Western pattern diet—high in carbs, low in fiber—which slows down bowel movements and increases the risk of obstruction in the appendix. Season –people are more likely to get appendicitis during summer rather than other seasons of the year. It is estimated that 1 in 1,000 individuals in the US get appendicitis. A young male with a family history of appendicitis or a child with cystic fibrosis have an increased likelihood of developing appendicitis compared to most people. Since there is no sure answer to "What causes appendicitis?" there is no specific way to prevent appendicitis. However, experts suggest eating tomatoes and green vegetables to reduce your risk of appendicitis. Processed tomato products like tomato sauce, cruciferous vegetables like cauliflower, cabbage, brussels sprouts, peas and beans may help reduce your risk of the disease. Abdominal pain may start as mild cramping that gradually becomes steady and severe. Bowl movement will not definitely be changed, but your urination may sometimes be affected. If you have severe tenderness on the right side of your lower abdomen, along with any of the above mentioned symptoms, call your doctor immediately because appendicitis can rapidly develop into a medical emergency. Your appendix may rupture within 24 to 48 hours after symptoms develop. Up to 80% of patients who have these symptoms for 48 hours end up with ruptured appendices. Perforation of the appendix is very dangerous and can lead to death, especially in very young and very old individuals. With knowing the answers to the question, what causes appendicitis, naturally, you will seek for possible treatment options to relieve this painful condition. Appendicitis is a serious medical emergency. The inflamed appendix can burst and can cause a serious, widespread infection. Your doctor is most likely to strongly recommend surgery (appendectomy) to remove the appendix, which commonly includes 2 different methods. This is traditional method. Under anesthesia, an incision is made in your lower right side of the belly, where the appendix is located. And the surgeon removes the appendix. If it has ruptured, the pus will be washed and drained out of the belly through a small tube or shunt. This shunt will be removed after a few days when the infection has disappeared. Under anesthesia, several small incisions are made on your belly and a tool with a camera (laparoscope) is used to look inside. The surgical removal of the appendix is also done through these small cuts. However, this method will not be done if your appendix has ruptured. Recovery from appendectomy takes only a few days if your appendix has not ruptured and if there are no complications. However, antibiotic treatment will be required and recovery time is longer for ruptured appendicitis. After an appendectomy, you need to follow proper after care to prevent complications and allow quick recovery. You may heal faster after a laparoscopy compared to traditional open surgery. Healing is also faster if your appendix did not rupture. Firstly, limit your activities until your abdomen heals, and the doctor will advise you when to resume normal activities. Secondly, you need to finish your course of antibiotics, even when you feel better after a few days. Also, remember to report severe pain or worsening pain to your doctor after surgery if it happens.